What is an Insect monitor spider trap? You may have seen one of these monitor traps in the bathroom at a restaurant, or in the corner of a carpet store. It's a simple paper board glue trap typically white on the outside, with square edges measuring 3 - 4 inches wide and 2 - 3 inches deep. On the outside you'll find manufacturer model information in black, red or even orange ( marketing message colors) and a grid with months and weeks called a IPM Record Keeper. Alternatively you may find a pest control company name on the outside of the insect monitor as a form of advertising. The familiar tent type insect monitor will often have a rectangular cut out on either side, and a warning saying in English and sometimes Spanish "Do Not Remove" / "No remover" along with a grid that shows months and several columns. Frequently these insect monitor traps will have a mounting strip or anchor on the underside. Because the spider trap has windows, it can't have a sticky glue / adhesive in those spaces, and also the ceiling has no trap surface. Another characteristic of insect monitor traps is the placement of the glue. Typically the traps distributed in sheets of 3 monitors, that can be separated into individual monitor traps. Insect monitors have been a component of Integrated Pest Management ( IPM ) practices for decades. Rather than just spraying pesticides everywhere, insect monitors would be set out and checked weekly to determine what, if any, insects (roaches, beetles, silverfish) or spiders of all types (house spider, hobo, brown recluse, black recluse) were present. The results would be entered on the IPM Record Keeper (which is also visible from the top of the trap). Pesticide usage would be based on the evidence of infestation recorded in the IPM Record Keeper ( this can be found on the side or top of the traps). Once full or too dusty to function an insect monitor would be discarded and new monitor set in place. Depending on the exterminator / pest control company policy, the record keeper data may or may not have been transferred onto the new monitor. Only pest control companies purchased insect monitors until the 90s. The largest brands were Catchmaster 288i, Trapper Monitor Insect Traps and Victor Roach & Insect Traps & Monitor. As the web became more ubiquitous consumers began to find access to products that they never would have seen in a grocery, hardware or big box store like Walmart or Target. Insect monitors were among these new found Professional pest control products. Because insect monitors are non-toxic, non-pesticide and simple to use, there are no FIFRA ( Federal Insecticide, Fungicide, and Rodenticide Act ) regarding usage or sales. There are several reasons why insect monitors are not ideal for home use. The reasons all track back to the genesis of the insect monitor as a IPM tool. Insect monitor windows allow insects and spiders to walk out of the traps. Many videos exist on the web of spiders walking out of the insect monitor. Ideally if you are using insect monitors, put a piece of tape over the windows so insect can't crawl out. The windows used to be for the pest control person to peek into the trap to count the insects, but we don't do that any more. Insect monitors were created as utility devices, with no concern for integration into their surroundings. In fact, to a degree it needed to stand out so an exterminator could spot the trap to count and record. This means there are some UNATTRACTIVE insect monitors on the market, glaring red print, even oranges with huge logos. Not so great for use in the living room. The need to record the insects doesn't exist in a home setting, so this record keeper is un-needed and ugly. Remember that the insect monitors come in sheets. Some manufacturers put glue in only a center of each monitor, so that once separated all 3 monitors look identical. Other manufacturers will put a strip of glue that extends from a margin on the left side of the first trap across the entire second trap, and to a right hand margin on trap 3. The result is that 1 trap is edge-to-edge glue, and the other two traps have a warning zone to edge glue placement. This can yield inconsistent results. Intended for IPM / Pest Control Professionals there was never a need to put instructions on insect monitors. So when it comes to how to use them, you may be on your own. Volume Pricing Because insect monitors are reasonably priced, it enables consumers to be liberal in the placement of the spider traps. The more traps you place, the better the odds of intercepting a spider wandering along a baseboard or edge of the furniture. So does a better Spider Trap exist? What overcomes the disadvantages of insect monitors while keeping the advantages in a spider trap? 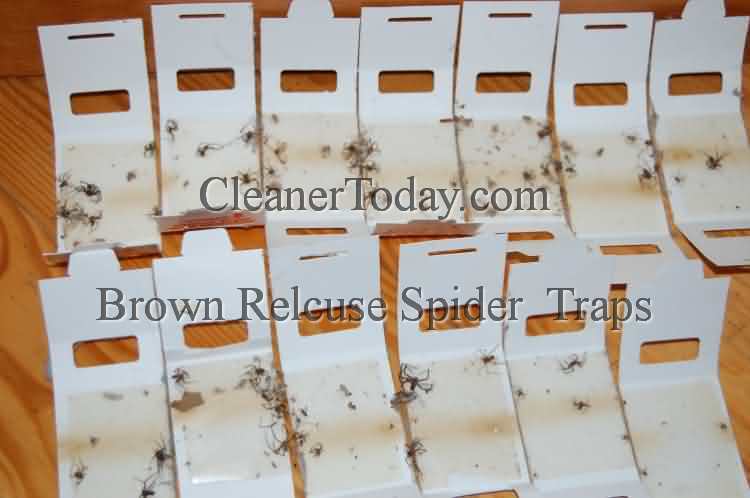 This entry was posted in Ask Traps Direct, Spider Traps Blog and tagged Advantage Spider & Insect Trap, brown recluse spider, house infestation, insect monitor.